Sometimes inspiration comes out of nowhere & to me, that’s one of the best feelings ever. I love when I’m just minding my own business, doing whatever it is at that moment and then stumbling upon something by chance that just totally sticks with you. The other day, I was walking to work and I swear, I saw not one, not two, but THREE amazing drape-y skirts. And since that moment, I’ve been going through a bit of a drape-y skirt obsession! Because I do not have one of my own (yet! ), I decided instead to put together this style set. I used three different draped skirts – (from left to right) one is styled for the fancy chick who likes to attend swanky events, one is styled for the casual chick who likes to look good while running errands, and one is styled for the chick who loves a good party. 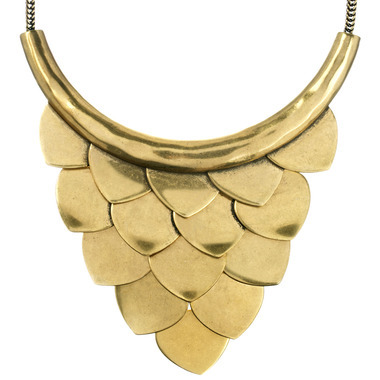 I also decided to use the Chloe & Isabel Metal Bib Statement Necklace for all three looks. I’ve probably talked about how C&I jewelry is perfect because you can literally wear it with anything, but the proof is in the pudding here! I could’ve gone with a quieter necklace, but I liked the contrast between the sharp gold metal (that almost looks like scales or armor) and the soft drapes of the skirts. I also picked these yellow shoes because, well, you could go with a similar gold strappy heel, but that would just be too expected! The yellow is bolder than gold, but it still goes with each of these three looks. Also everybody, I have a brief announcement! As this blog is a continuing work of progress, things are always changing. I am actually beginning to work on the possibility of my own business/social enterprise (more details to come later! ), and so I am making a few changes to the site now! My new e-mail address that you are welcome & encouraged to contact me at is: thestylebandita@gmail.com. If you’re an instagram user, you can also follow me @ chloen91!